1 of 8 Place 8-inch round cake pan in oven. Heat oven to 200 degrees F.
2 of 8 Boil sugar and water in small heavy-bottomed saucepan over medium heat without stirring, until amber-colored, about 13 minutes. 3 of 8 With oven mitts, remove cake pan from oven. Carefully pour sugar mixture into pan, turning pan until bottom and sides of pan are coated. Set aside on rack to cool. Lightly butter any uncoated spots on pan. 4 of 8 Increase temperature to 350 degrees F.
5 of 8 Bring half-and-half and cream of coconut in small saucepan to a boil, stirring occasionally. 6 of 8 Whisk eggs and yolks in bowl. Slowly whisk coconut cream mixture into eggs; add rum, vanilla, allspice. 7 of 8 Place coated cake pan in small roasting pan. Pour egg mixture into coated pan. Place on middle rack in oven. Pour enough boiling water into roasting pan to come halfway up sides of custard-filled pan. 8 of 8 Bake in 350 degrees F oven until custard is just set and knife inserted near center tests clean, 35 to 45 minutes. Transfer cake pan to wire rack to cool. Refrigerate at least 2 hours. 1 of 1 Run knife around edge of pan. Invert serving platter on top of pan; invert flan onto platter, letting caramel run over top and sides. 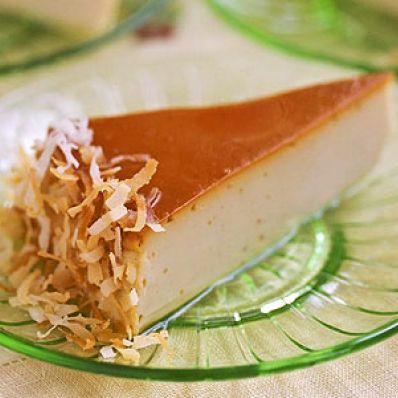 Serve with toasted coconut sprinkled on top.